Book Information: LIFE LOVE TAROT ‘A doorway to understanding life’s journey’ is unlike any other tarot book. It truly is a book of life and love. Yes, it is based around the tarot, but the tarot cards are merely a prop to explain the many aspects of life. Dawn Alice opens her heart as she speaks candidly about many of her life experiences, including the death of her daughter through tongue cancer, leaving her first husband for another man, her quadriplegic step-daughter and the still-birth of her grandson. A book of motivation and inspiration that can be read by anyone; LIFE LOVE TAROT is easy reading that will touch your soul at the deepest level. Become the illustrator of your own life and open your mind and heart to the power within. LIFE LOVE TAROT contains 78 different affirmations to build confidence, self-esteem and right attitude. Discover the energies of 78 assorted crystals and how they can eliminate negativity, bring luck and enhance your life. Awaken your passions and transform aspects of your life through creative exercises and visualizations. Unlock psychological blocks, clear the mind, release tension or connect to spirit guides through the art of meditation. This journey of spiritual development eradicates ignorance, stimulates thought and action, and encourages the reader to grow through life’s lessons. Brief Bio: Dawn Alice’s early childhood was different to most other children who only had cats, dogs and birds as pets – Dawn had monkeys, foxes, peacocks and other exotic creatures. Her free- spirit was allowed to bloom in the wide open spaces of her parent’s zoo. Her vivid imagination, charismatic personality and psychic awareness have taken her down many paths that broadened her outlook on life. 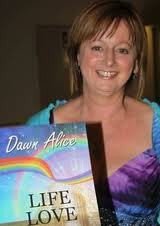 Exhibiting a wealth of knowledge and wisdom, Dawn Alice is happy to share with all who are willing to learn. 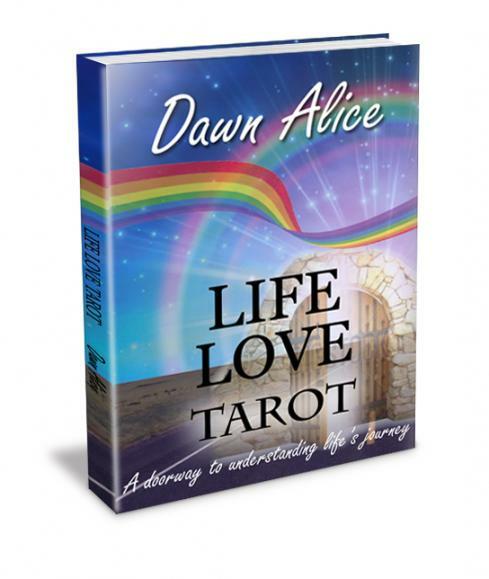 Writing LIFE LOVE TAROT seemed to be a natural progression, which stemmed from Dawn Alice’s career as a Tarot Reader, Numerologist, Reiki Master, Crystal Therapist and Workshop Facilitator. Born in November 1955, Dawn Alice is an effervescent Sagittarius with a passion for life. Her roles as a wife, mother, step-mother and grandmother have precedence over all episodes in her life. Dawn Alice currently resides in Brisbane, Australia. Item: A Tarot Reading. This reading can be personal for people within travelling distance to Brisbane or email for far away friends.